Atlanta, GA, November 8, 2018: The Abrams for Governor campaign held a press conference today with the campaign’s litigation team and senior leadership to confirm that they are pursuing multiple options to ensure that every single eligible vote cast is a vote counted. “As the legal team outlined and made clear based on facts, it is not possible for the Secretary of State to assert that they know the total number of outstanding ballots, given that there are more votes yet to come in and provisional ballots have yet to be counted. Additionally, as we saw with Cobb County, despite the SOS office having asserted that all absentee ballots have been counted, an additional/new 236 votes for Abrams, 65 Kemp and 2 Metz votes have been identified as of the morning of 11/8,” the campaign said through a press release. “Our opponent Brian Kemp should want the same thing so that the people of Georgia can have full confidence of the legitimacy of the person who ultimately becomes Georgia’s next governor,” the release said. Below is a reproduction of the text from the press release. · Voters continue to report they are unable to verify on the Secretary of State’s website the absentee ballot they submitted has been counted. 1. Complaint Being Filed in Dougherty County – The campaign is filing a complaint in the U.S. district court for the Middle District of Georgia in Dougherty county asking for an injunction to direct the board of elections to count any absentee ballots received between 7pm on election day and close of business on Friday, which is consistent with the way that counting overseas military and overseas citizens’ ballots are handled. · The impact of Hurricane Michael also remains entirely unknown. Many parts of south Georgia have their mail routed through Tallahassee, which suffered severe damage. How many ballots were delayed because of the storm or other factors remains unknown. We also do have reports from our hotline indicating that ballots never showed up, or showed up late in south Georgia. 2. Preservation Hold Request – The campaign is formally requesting that all counties preserve any and all documents that may pertain to the election on November 6, 2018. 3. Absentee Ballots – We are investigating multiple cases from students who believe they timely and properly submitted their absentee ballots but when they checked the Secretary of State’s website, it appears that those ballots have not yet been accepted. Therefore they are not being included in the most recent count. The Secretary of State’s office has not responded to these students regarding when their votes will be counted. 4. Provisional ballots – The Abrams for Governor campaign is working to try to get more information regarding the provisional ballots, but as has been conveyed, the Secretary of State’s office is being slow to respond. One of the challenges is that as we pursue these questions, in many instances, we’re relying on hastily scribbled handwritten notes and unclear directives from the Secretary of State’s office to the counties. · John Chandler, a retired Sutherland Asbill & Brennan and King & Spalding partner, is a Fellow of the American College of Trial Lawyers and has 40 years’ experience trying cases. · Elizabeth Tanis (Beth), who also was a partner at Sutherland Asbill & Brennan and King & Spalding, is an experienced trial lawyer listed as a leading lawyer in Chambers USA America’s Leading Lawyers for Business and was named by Atlanta magazine as one of Georgia’s top 100 lawyers and top 50 female lawyers. · Allegra Lawrence-Hardy, a founding partner of Lawrence & Bundy, and a former partner at Sutherland Asbill & Brennan, has extensive experience handling election law matters, most recently representing the City of Atlanta in the very close mayoral election of 2017. She has over 20 years of litigation experience and is a fellow in the Litigation Counsel of America and is listed in Best Lawyers in America. Ms. Lawrence-Hardy also serves as Chair of the Abrams for Governor campaign. · Dara Lindenbaum, a senior counsel at Sandler Reiff Lamb Rosenstein & Birkenstock, P.C., advises federal, state and local political committees and candidates; state parties; ballot measure committees; 501(c)(3) and (c)(4) organizations and for-profit corporations. She counsels clients on complying with state and federal campaign finance and election laws and regularly represents clients before the Federal Election Commission, federal and state courts, and state and local election boards. Prior to joining Sandler Reiff, she was an associate counsel in the Voting Rights Project at the Lawyers’ Committee for Civil Rights Under Law where she focused on election law and voting rights. 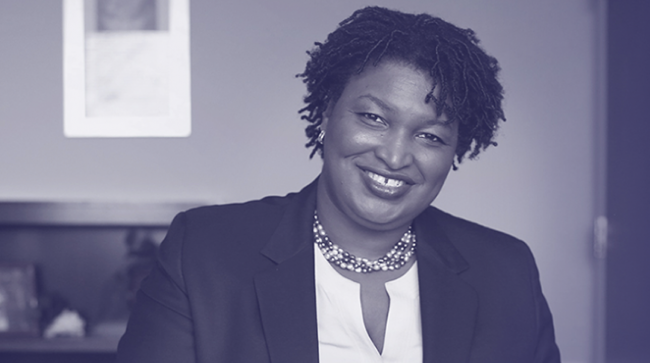 She is a member of the Steering Committee for the Political Law Studies Initiative at George Washington University Law School, and she serves as General Counsel for the Abrams for Governor campaign. · Kurt Kastorf, of the Summerville Firm LLC, is an appellate and Supreme Court litigator with particular knowledge of constitutional and election law issues, both in Georgia and nationally. He has served as general counsel to a U.S. Congressional Campaign, and helped to plan and implement litigation strategy for Hillary for America.